Whilst Filey was being completed the Admiralty asked Billy Butlin to build another camp on the South Coast, but this plan was dropped when the whole of the North Coast of France fell into German hands. Instead they asked him to build two more camps, one in North Wales and the other on the west coast of Scotland. 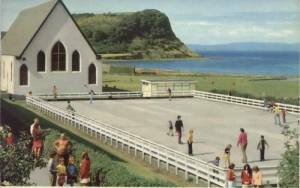 The site chosen for the Scottish camp was at Ayr, and this was situated four miles south of the town on 85 acres of gently sloping land which formed part of the Heads of Ayr coastline. As with Pwllheli, the design of the camp was heavily influenced by the eventual hope of transforming the site into a holiday camp when the war was over. Work commenced in 1940 and it opened the following year as HMS Scotia and was used throughout the war as a Navy training camp. After the war was over the Navy began moving out and the camp was eventually transferred into Butlin's ownership in 1946. After some hurried construction and repairs the site opened the following year as a holiday camp. Upon opening it could accommodate close to 2000 guests but this was eventually increased to over 5000. The Redcoats working here originally wore kilts and even Bobby Butlin (Bill's son) was a Redcoat here during his school holidays. Holiday makers at Ayr camp also enjoyed a different kind of awakening in the early days. Instead of the early morning tune played by Radio Butlin, two pipers would solemnly march around the camp awakening every camper! The Heads of Ayr Hotel was also opened in the 1940s and was situated on the main road, adjacent to the camp entrance. An old railway line also ran through the site so plans were put forward to build a new station to serve the camp and hotel. Trains ran direct from Ayr, Glasgow, Newcastle and Leeds and provided the main transport link during the early years. The railway line remained open until the end of 1968. 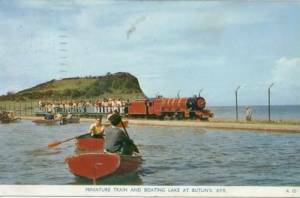 Further attractions were added over the coming years including the indoor swimming pool, the miniature railway (in 1956) and the first of the Butlins chairlifts (in 1959). In 1965 a pair of full size steam locomotives arrived. A Carousel appeared in the late 1950s and remained here for over 40 years - it still survives today at Dreamland Margate. In 1980 a £1.8 million investment scheme was launched but only seven years later the future of the camp was looking uncertain as the site was the least profitable of the five remaining camps. The final months of the 1987 season were closely watched to see if it would be worthwhile to invest in the complex and on 14th October Butlin's finally announced a £25 million investment programme. The decision to go ahead was taken after the Scottish Tourist Board pledged their support in the project. Work began the following year and £12 million was immediately invested in the creation of a new indoor water complex, three star accommodation for all holiday makers, a new 900-seat food court and a face lift for the caravan park. The remaining £13 million was invested over the next five years. The site was then renamed Wonderwest World. It was not to last. 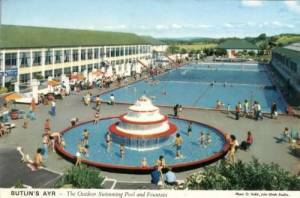 Ten years later it was announced that the camps at Ayr and Pwllheli would be transferred to Butlin's sister company of Haven for the start of the 1999 season. Another £25 million development plan was announced, split between the two parks. Work soon began and many of the old much-loved attractions were removed including the chairlift, miniature railway and amusement park. Luxury caravans replaced many of the old chalets, most of which were demolished along with some of the main camp buildings. The new plan was to offer fewer but more up-to-date attractions and to place the emphasis on attracting more younger families. The site is still open today and is now known as Craig Tara, a Haven All-Action holiday park. The official reopening took place in 1999 and was performed by football legend Kenny Dalglish.